Posted by Administrator on July 14, 2018. Any sports fan will concede that Croatia’s brilliant determination to make it to the Finals of the FIFA World Cup 2018 in Russia is phenomenally amazing! Twenty years ago, in 1998, with legendary players such as Zvonimir Boban and Davor Suker, Croatia unexpectedly beat all odds and made it to the Semi-finals, losing to France who went on to become the World Cup Champions. In the consolation match for 3rd/ 4th place, they showed their class once more by beating The Netherlands 2-1. 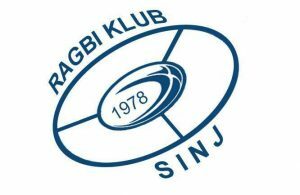 Approximately 400km south of the Croatian capital city of Zagreb is the town of Sinj which is home to Sinj Rugby Club which celebrates its 40th anniversary this year. 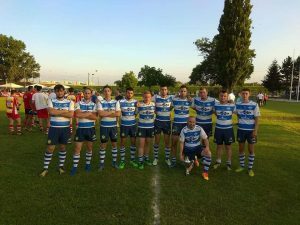 To celebrate its anniversary and also to let you know how you can get involved in playing Rugby if you happen to be in Croatia, we take a look at the club in detail as we chat with club administrator, Hrvoje Grčić. Q: What is your Club name and when was it established? A: Our club name is “Ragbi Klub Sinj”, named after our hometown and we are located about 400 km south of Zagreb. We were established on the 13 th of July 1978 after Marko Protega, a well-known sportsperson and Jakov Dukić, a student who went to university in Zagreb found out about the game of Rugby. Sinj played first official game agianst Nada from Split. Q: How do people get in touch with the club and what are your colors and or mascot? Q: What Rugby do you play? XVs/ Sevens/ Tens/ Touch/ Beach? Age grades? Women’s Rugby? A: We play in the National XVs in which we placed 3rd this season. We also play in the National Sevens where we placed 2nd. We play Beach rugby where we took 1st place at a recent tournament and until recently we did have a women’s Rugby Team but the ladies had trouble finding time in between their jobs and school so we don’t have one at the moment. We also play touch but only for fun. Q: What Competitions & Tournaments you play in? 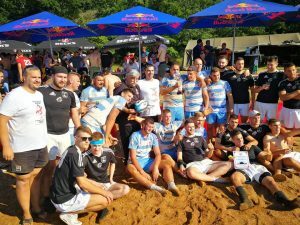 This year we played in the Regional Rugby Championship with RK “Makarska” under name of Dalmacija, against teams from Croatia, Bosnia, Serbia and Slovenia. We finished second with only one point behind first team, Nada. We also played at Cup of Croatia and reached the Finals to play against Mladost fom Zagreb. It was a tough game that we unfortunately lost, although we were leading in half time. Q: Who are your notable players? A: Our club has a history of great players. One of them is Marinko Klarić Kukuz who was top try scorer for our club, Yugoslav and Croatian National Team representative. 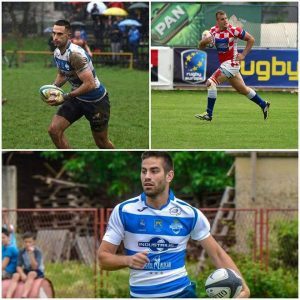 Probably the best player of our club is Marko Grčić, who was born in 1991 and started playing Rugby in post-war Croatia in 1998 and developed as a gifted player. Marko is currently Captain of our National team for both Sevens and XVs. He was awarded the trophy for Best Sports Person of the town of Sinj twice and he has played in France, England and Germany. He was one of the first generation of youngsters born after the war ended that started to play Rugby which was also when our club started to participate in Croatian League. Q: Do you have Junior Rugby? A: Four years ago we created school of Rugby for young children, aged 8-14 and we currently have around 70-90 chlidren in our club. They internal play tournaments at our Rugby school, but we are proud that our U-14 team is current Croatian Champion. They are true sign of talent and a bright future for our club. Our Junior Rugby team that is managed by Ivica Dinarina SImic were European Champions in the Trophy Cup. Ivan Prološčić who plays for us was recognized as Player of the Tournament too. Q: Do a lot of people play Rugby where you are? A: Considering our environment Rugby is quiet popular here in Sinj. We have around 200 members in our club and when you consider that football and basketball is main sport in our community, those are very good numbers for a town of only 25,000 people. 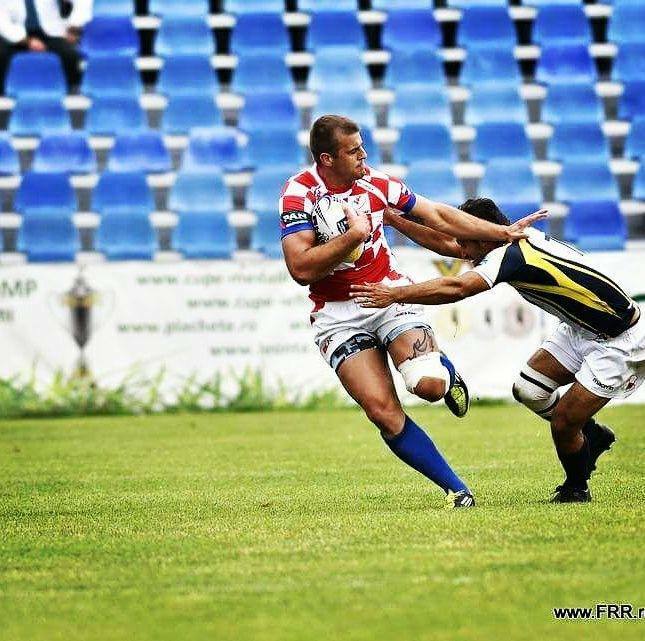 Although Rugby is only 3rd most popular sport in Sinj, we always have around 300-500 people who support our team. We are sports nation, but especially in the Dalmatian inland, it’s in our blood! We are a physical team, with lots of guts and willpower, and before we had our own grounds, we used to train at the military base with the troops. We have a natural fighting spirit, and when people started watching our games, they became interested in this exotic game. If you ask any person in Sinj about Rugby they will tell you about our team and have a general idea on the Laws which is a great success in football nation like Croatia and a small town like Sinj. Q: Besides players, do you accept volunteers for coaching, medics and other support? A: Our members operate on voluntary basis for coaching, medics and everything else. We have a limited budget so we depend on support from our local comunity and sponsors. We are all in this because of our love for the game and its values, so nobody gets paychecks and nobody seeks it. Q: When does your season start and finish? A: Our season starts early in September, and finishes by the end of July, depending on the Regional Championship and Sevens Rugby schedule. Q: Is there any message you want to say to Global Rugby Community? Maybe your hopes for Rugby in Croatia and a prediction for RWC 2019? A: We hope rugby develops more in Croatia, and it gains more ground in the global community like football, because it has a positive influence in bringing communities closer, develops character, and accepting diversity. Our country was in a war after Yugoslavia fell apart but we were able to play in the Regional Rugby Championships against Serbian teams and make strong friendly ties with other players from the Balkans, only 12 years after war broke out. Rugby brings us closer, we might be enemies on the pitch but we are always friends in the 3rd half! The RWC will be difficult to predict. Scotland is there to prove something and England are seeking a breakthrough. I think the final match will be New Zealand against Scotland, and I hope the Scots will giv New Zealand a run for their money.